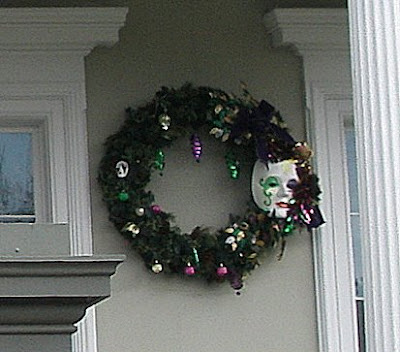 It has come to my attention that people in many parts of the world are unaware that in New Orleans, many people decorate the outside of their houses for Mardi Gras in the same way other people do to celebrate Christmas. This being the weekend before Mardi Gras, I thought I'd share a few photos I took of this phenomenon. 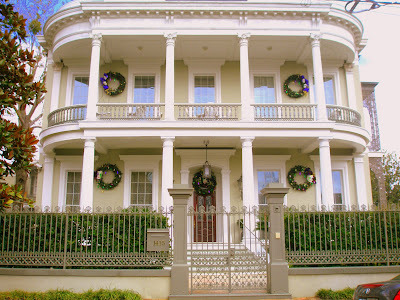 The symmetry of the architecture is enhanced by the placement of the Mardi Gras wreathes in this elegant yet festive presentation. 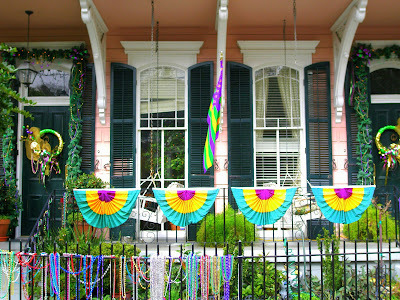 The Owners of this house are Mardi Gras Maniacs. They have very little restraint when it comes to their Mardi Gras decor. 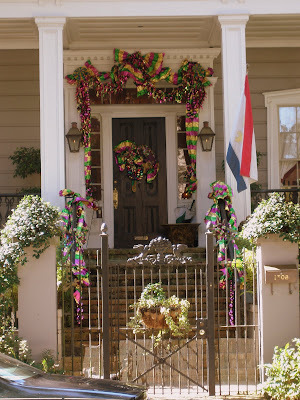 Notice how they recycle their Christmas garland and re-fit it with Mardi Gras Beads. 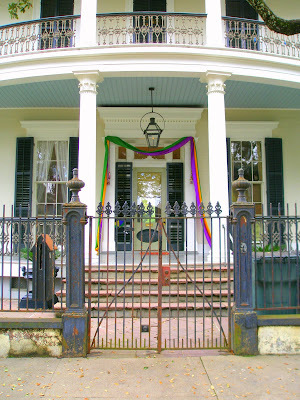 The drapery along the front of their railing hammers the theme home as does the American Flag done in Carnival Colors and the Mardi Gras beads hung alon their fence. This house belongs to my next door neighbors! 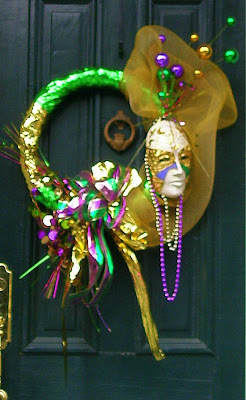 A Detail of their Door Decorations, Fun and Fabulous! 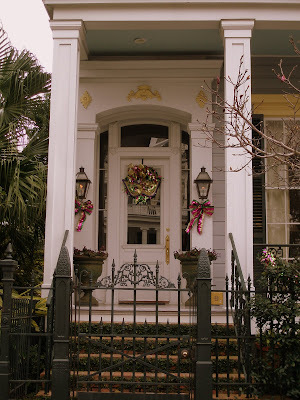 This house is all fun and fabulousness with its combination of garland, wreath and beads along the fence. 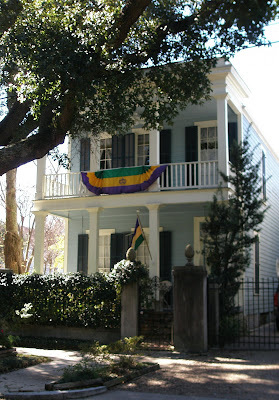 The LSU flag, purple and gold shows who this homeowner is rooting for! 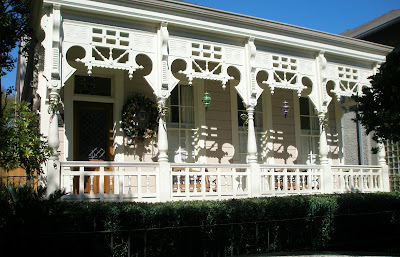 This gorgeous gingerbread house, decorative in its own right. I love the understated purple and green drops hung in the arches. This purple, green and gold drape gets the message across in the most simply elegant way. This house has it all! 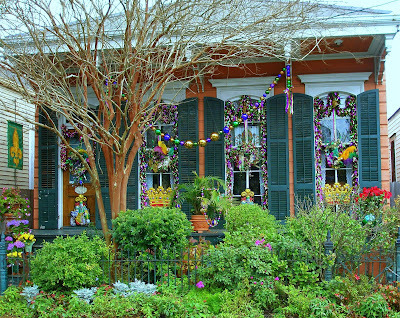 A huge strand of Mardi Gras beads hung from the brackets, golden crowns in the windows, flowers in the Mardi Gras colors, feathers, metallic garlands and a green and gold fleur de lis flag! 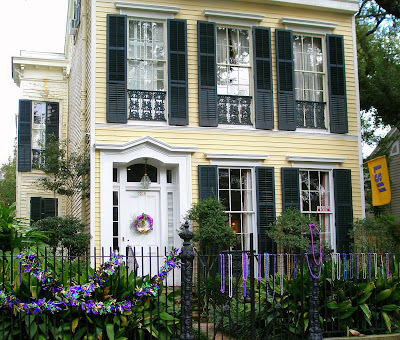 Another profusion of Mardi Gras wonder! 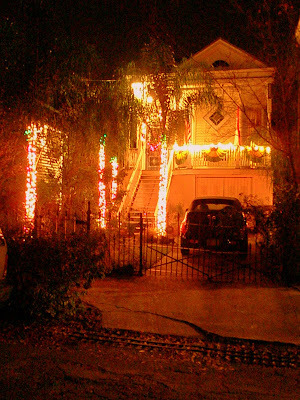 This house, lit up at night in the Mardi Gras colors is so much more fantastic than this photo can show. 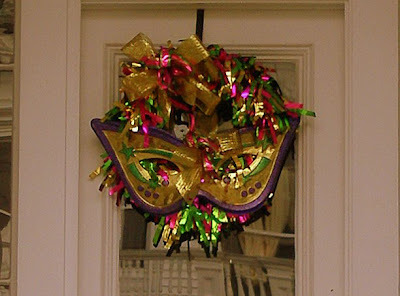 I end this post with simplicity and beauty and festive simple draping of the Carnival Colors. I'm off to the parades! Stay tuned for more!